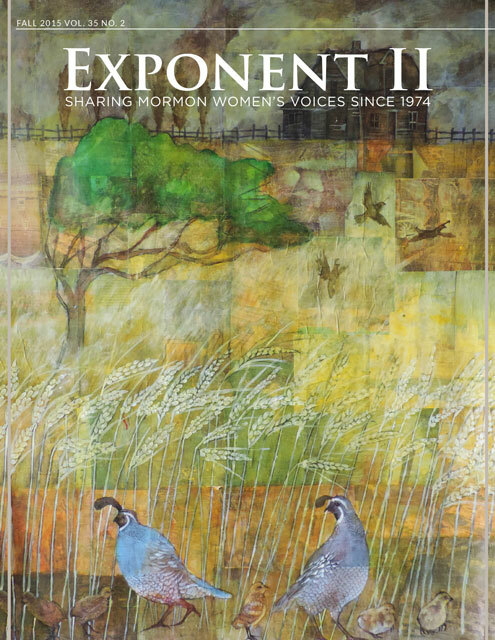 The summer issue of the Exponent II magazine arrived in my mailbox on a day when I. was. done. in. Managing two moody teenagers, a neglected dog, new administrative responsibilities at work, a series of contentious school board meetings and half a dozen high-energy kids in my Primary calling left me feeling as transparent and empty as the Mason jar on the magazine cover. That day, I wished my life could transform into a heartwarming General Conference story where someone shows up at the perfect time with a casserole and a listening ear and saves the day. No friend, no casserole appeared. But thumbing through the magazine, I found an article that spoke directly to my ragged and unkempt soul. And with it – a recipe! For “Where Can I Turn For Peas . . . And Prosciutto Risotto.” I decided then and there that I would dedicate the next few hours to self-care, starting by making myself the warm, hearty meal I had momentarily hoped would appear on my doorstep. I took a deep, grounding breath, poured a can of Diet Coke into a fancy goblet, and proceeded to follow the instructions. Forty-five minutes later, I was sitting at my kitchen table in a bubble of bliss eating delicious food off my best china plate and devouring the summer issue of Exponent II. The Exponent II community has fed and sustained me over many years. The retreat is my spiritual reset, filling me up with the patience, love and hope I crave to make it through another year of work, parenting and church. The Facebook group and the blog nourish me on a regular basis with the knowledge that my experiences both are and are not unique. But the Exponent II magazine is my lifeline. It is a tangible connection to my people. I can pick it up off the coffee table, turn its glossy pages, and find enlightenment and wisdom inside. I savor each poem, story and work of art. When a new issue arrives, I can’t bear to part with the old one, so it goes on a shelf alongside my treasured books. Who do you know that deserves a friend and a casserole this season? Send her a subscription to the Exponent magazine! Subscribe to or buy a gift subscription to Exponent IIhere. Your support keeps us going for future generations of Mormon feminists. Every person who buys a subscription this week will be entered into a drawing for “Illuminating Ladies,” Exponent II’s coloring book about Mormon women. This is beautiful. Thank you for sharing this story! I think it’s really instructive that sometimes God takes care of us by sending someone with a casserole, and sometimes God takes care of us by sending us the instructions for a casserole.